Join us on Saturday the 16th of February for the HOTTEST onstage performance from the Pulse Dancers! Loads of prizes, games and of course the Pulse Dancers doing what they do best! Limited seating is available – book your table to reserve yours & avoid disappointment! 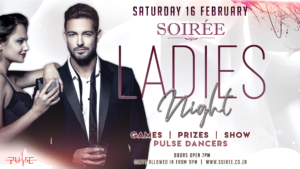 Gents – find your Valentine amongst Joburg’s sexiest ladies at the Singles After Party from 9pm!